The electronics recycling industry is a heavily regulated industry that requires companies to gain certifications to ensure environmentally-friendly facilities and best practices. Unfortunately, there are some cases where companies try to bypass the certification processes to increase their chances of winning new contracts. Although this was the first time SERI saw a counterfeit R2 certificate, it’s not the first case of a business misrepresenting facts about having one. Most cases of misrepresentation involve placing the R2 logo on a company website, without any other proof. The validity of these certifications often goes unchecked because clients do not take the time to verify whether SERI officially lists these companies on their database. 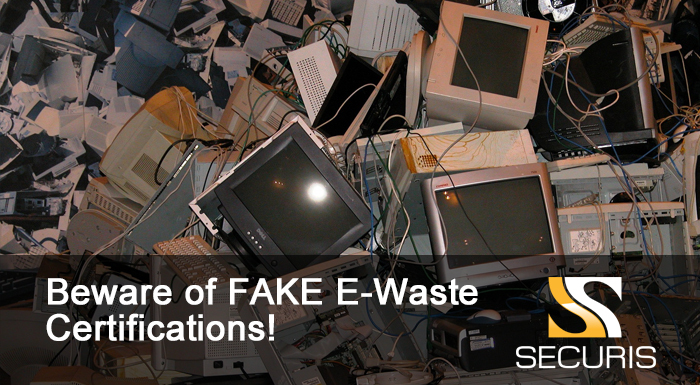 Electronics recycling companies must go through three steps to become R2 certified by SERI. In the first stage of the certification process, the company fills out an application with information about their company/facility and designates a point of contact who SERI will communicate with during the certification process. After applying for a license, the facility must contact a SERI-approved certification body (CB) to conduct the audit and issue the R2 certificate. Examples of SERI-approved certification bodies include National Standards Authority of Ireland, NSF International, NQA, Orion Registrar, Perry Johnson Registrars, SAI Global, SGS, and TUV SUD. After signing the agreement, the company gets an invoice for their annual R2 membership, which must be paid prior to their Stage 1 audit. The funds pay for the licensing of the R2 logo and name, as well as member benefits provided by SERI, including facility listing on the SERI website; free access to training programs, workshops or other forums; the R2 Implementation Manual and other technical assistance materials, and support from SERI staff. When you decide to work with an electronics recycling company, you need to make sure they have an official R2 certification. Uncertified recyclers could end up costing you time and money and put you at risk of compromising sensitive customer information. Companies with R2 certifications not only ensure quality results, but they also uphold transparency and environmental and social responsibility in their electronics recycling facilities. As an R2 Certified company, Securis committed to helping its clients tackle their recycling needs in the most cost-effective and environmentally-friendly way. Contact us today to learn more about our services.